Lately, my Blackhawks cards have been given a boost from recent envelopes that have arrived at my door. I did a lot of hockey collecting in the early 90s, but only get a pack here and there lately. There are not a lot of hockey releases that get me excited. Plus, there are not a lot of hockey dime boxes at the show I hit. However, they must exist based on what I have received over the past week or so. My buds Chris and Kyle from Old Foul Cardboard must have the greatest Chicago themed card shows in their area. They find all the really good stuff that my binders need, like this trio of Blackhawks cards. But that is just the start of this envelope. Sure, it's not a Blackhawk or a White Sox, but Chris ran a little contest and I was able to snag this sweet auto he gave away. But here's the real treat they sent. 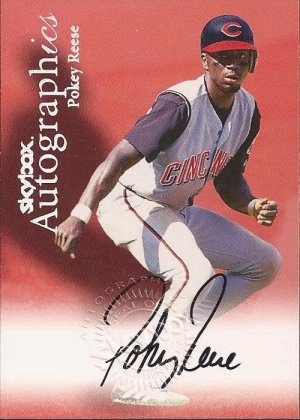 Like I said - awesome themed ChiSox card shows in upper NY. I cannot get enough of those blue swatches. Thanks as always, guys. 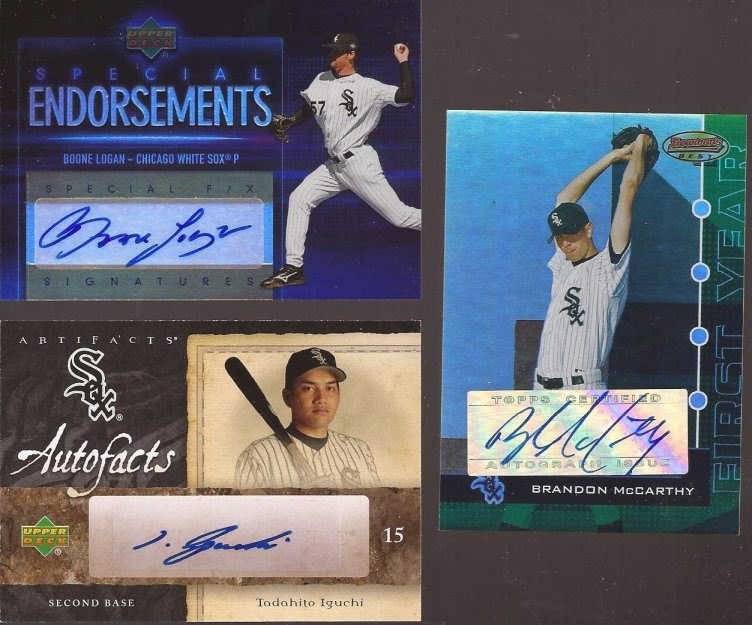 Matt from Bob Walk the Plank took a liking to my trade bait page and offered a few White Sox autographs. I have been hoping to add a McCarthy auto for some time now, so I was quick to say yes. I miss Boone Logan being in Sox pinstripes - he was a decent setup man. And that great Iguchi for my player collection. Thanks a bunch, Matt! A few weeks back, I posted a flow chat based on DimeBox Nick's mini collections. I realize, though, after getting a package from Corey at Tim Wallach that I made a small error. Let me correct that chart here. That's more like it. Like everyone (including you if you have not started), I put any and all Wallach's aside and send them to Corey from time to time. Never care if I get anything back, but Corey has been super nice a couple times with a return package. Hendry did not turn into the defenseman we expected. Those other two guys pictured, though, did ok.
No idea why my shinies always scan blue. Kopecky is a good 4th line grinder now in Florida. I was glad they got Versteeg back this year - he has some good talent. And there's that Toews kid again. If only he would do something amazing once in a while. Corey threw a few White Sox in as well. 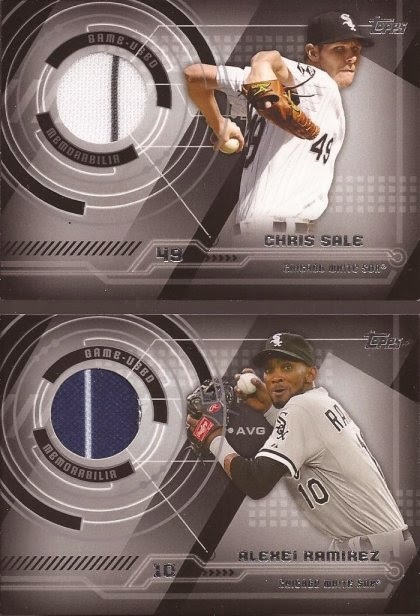 Refractor chrome Heritage of Sale on the right. Pretty. Thanks again, Corey. Alright - tonight I'll be at the Cell Comiskey to catch the Sox and the Rays. Minosa mini statue giveaway tonight, so I hope I get one. Maybe I can see that Abreu kid do something amazing, too. I also collected hockey cards furiously in the early 90's...not so much now. 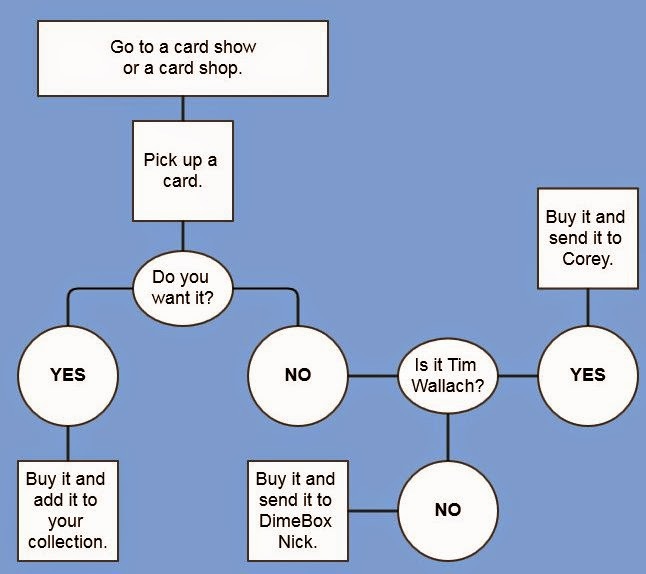 And yes, I also save all my Tim Wallach cards for Corey. Glad they made it unharmed.